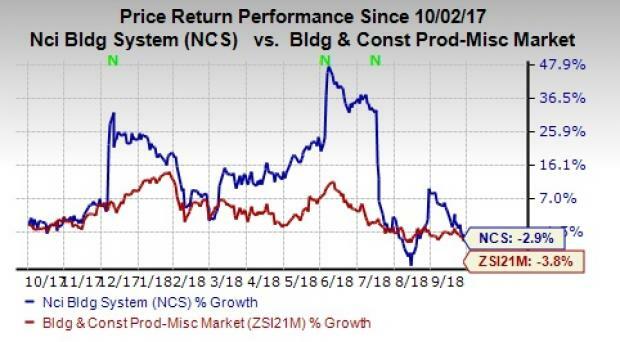 Strong backlog position, returns focused growth plan and robust market demand, along with cost-saving initiatives bode well for NCI Building Systems, Inc. NCS. Consequently, earnings estimates for fiscal 2018 and 2019 have moved up 2.1% and 2.3%, respectively, over the past 60 days. Although shares of the company have lost 2.9% in the past year, it has outperformed its industry’s decline of 3.8%. Let’s delve deeper into the factors that substantiate its Zacks Rank #2 (Buy). Strong Backlog & Solid Growth Prospects: NCI Building recorded 12.1% higher consolidated backlog at the end of fiscal third-quarter 2018, banking on solid contribution from key leading indicators and incoming order rates across businesses. The company expects combined Buildings and Components businesses to come up with 2-4% volume growth for the addressable portion of low-rise starts for fiscal 2018. NCI Building is poised to benefit from its focus on executing advanced manufacturing and improvement initiatives. Furthermore, for fiscal fourth quarter, the company projects revenues within $550-$570 million (versus $488.7 million reported in fourth quarter of fiscal 2017) and adjusted EBITDA in the range of $60-$70 million (versus $53.9 million), supported by bookings and backlog strength, as well as encouraging economic indicators. Growth Initiatives: NCI Building has three key areas of focus relating to cost efficiency and growth, namely implementation of advanced manufacturing, cost reductions with Lean and Six Sigma initiatives, and growth strategy surrounding Insulated Metal Panels (IMP). The impact of these three initiatives will be $40-$50 million by 2020, leading to margin and EBITDA expansion, and a reduction in overall expenses. Rising demand for key products and strategic actions is likely to help NCI Building in achieving long-term growth. The company’s focus on investments in automation and process innovation will slash operating costs, improve margins, quality and service, as well as enhance long-term operational flexibility. A key element of this initiative is the execution of an automated frame line for Buildings business. Additionally, the introduction of Lean and Six Sigma initiatives throughout the entire business will reduce excess operational back-office costs and simplify business. The company believes that there will be more opportunities for further cost reduction and operational efficiencies. Notably, the company is highly focused on its growth strategy surrounding IMP. Non-residential construction starts in fiscal 2018 is expected to rise in mid-single digits, with addressable markets for legacy businesses likely to be up 2-4%. Given the fact that NCI Building is one of North America’s largest integrated manufacturers and marketers of metal products for the non-residential construction industry, it is poised to gain from the anticipated growth in fiscal 2018. Solid VGM Score: NCI Building has an impressive VGM Score of A. Our VGM Score identifies stocks that have the most attractive value, growth and momentum characteristics. In fact, our research shows that stocks with VGM Scores of A or B when combined with a Zacks Rank #1 (Strong Buy) or 2 make solid investment choices. Superior ROE: NCI Building’s return on equity (ROE) supports its growth potential. The company’s ROE of 29% compares favorably with the industry’s average of 12.4%, implying that it is efficient in using its shareholders’ funds. Other top-ranked stocks in the industry include Continental Building Products, Inc. CBPX, PGT Innovations, Inc. PGTI and Patrick Industries, Inc. PATK. While Continental Building and PGT Innovations sport a Zacks Rank #1 (Strong Buy), Patrick Industries carries a Zacks Rank #2. You can see the complete list of today’s Zacks #1 Rank stocks here. Continental Building’s earnings are expected to increase 52.6% for the current year. PGT Innovations’ earnings are likely to grow 80.3% in 2018. Patrick Industries’ earnings are projected to grow 49.4% for the current year.